In 2012, we opened a brewpub on the north side of Chicago. Here, we brewed great beers, hosted some pretty epic events and made some good memories. Unfortunately, at the end of 2015, we were faced with the harsh reality that this place that meant so much to us could no longer be called Atlas Brewing Company. We would have to rebrand. We burned it all down so we could build it back up. Of course, we don’t mean literally (though there has been real fire involved). From the ashes, we rebuilt bolder, braver and wiser than ever. Burnt City Brewing is about getting back up. It’s about overcoming obstacles. It’s about perseverance. It’s about great beer. This is about being who we really are as people and as brewers. We’re excited for what’s to come and we hope you join us in Burnt City. While navigating the post-college wasteland of crappy office jobs, John travelled as much as possible, picked up some work in a bar, and started homebrewing. Gradually it dawned on him that he believed in few things as strongly as good food, good company, and of course, good, fresh, beer. John believes in all the world’s brewing traditions, and also in the innovation and playfulness of the new beer revolution. Mostly, he believes in the camaraderie that pairs so well with a few good pints. Christian, a Chicago Native, once treated beer and brewing only as a hobby.He originally started brewing at home in 2010. Having taken the Concise Brewing Course at the Siebel Institute and spending a few years working for a homebrew supply store, he first began brewing professionally as the Lead Brewer at Lake Effect Brewing Company. Now he responsible for brewing and watching over the beers at the Burnt City Pub. He does so with a well developed love of beer and the people who drink it. After spending a few years selling beer and wine in bars and retail stores, Ben decided to leave behind the life of a merchant and follow a new path lined in majestic hops and golden barley. 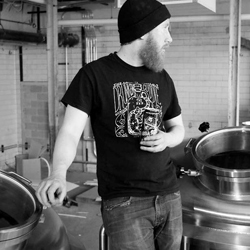 This path lead him to a towering throne of woven wheat where he now sits as Head Brewer for Burnt City. Aside from drinking beer, he enjoys nothing more than formulating new beer recipes and tweaking old ones. Ben thinks that beer should be an expression of every ingredient that goes into it, and his appreciation of depth and balance has provided an underlying philosophy for Burnt City’s beer. He is excited to be part of an amazing, flourishing industry in his home city.